Just spectacularly awful, but I couldn’t look away, because a. I think I was amazed that the yeti costume from Harry and the Hendersons has held up so well and, b. the film was shot in the forests of Oregon and that kind of made me want to make the entire state my new hiding place. Yes, I am having visions of picking up my bakeware and hightailing it westward. Maybe it’s the ol’ quarter-life crisis popping up again, or maybe it’s just restlessness from spending my entire life in Da Hurst (That’s Elmhurst, for all of you fancy folk who don’t know Queens. Please don’t Google Map me. ), but I am tired. Some random old dude rammed into me on my way home from work the other day, just because he could! Seriously, he went out of his way to walk toward me and knock into me (Yes, I do believe he was certifiably deranged, but still). Some other random young dude stomped on my tiny foot on the F train that same night and did not apologize! ANIMALS! The chances of me actually fleeing the state anytime soon are pretty slim, but I still think it’s time for a change, for the above reasons and trillions more that have nothing to do with baking. Maybe I need a new neighborhood to call home and a new challenge to completely sink into. Does anyone have an obstacle course you can throw my way, or perhaps a complicated mathematical formula in need of solving? I can’t help with the latter, but I’d be able to find someone who can and maybe make a new friend in the process. Maybe I can even teach the nerd to bake. 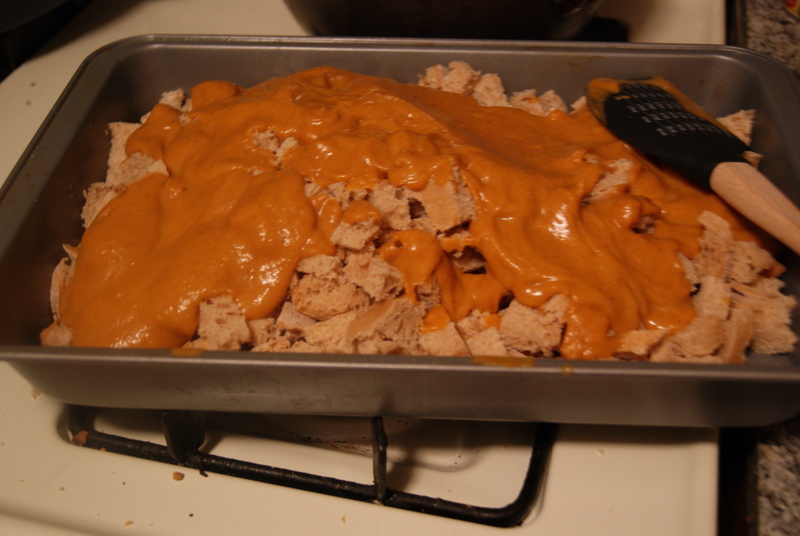 Preheat your oven to 350ºF and grease a 9×13″ baking dish. 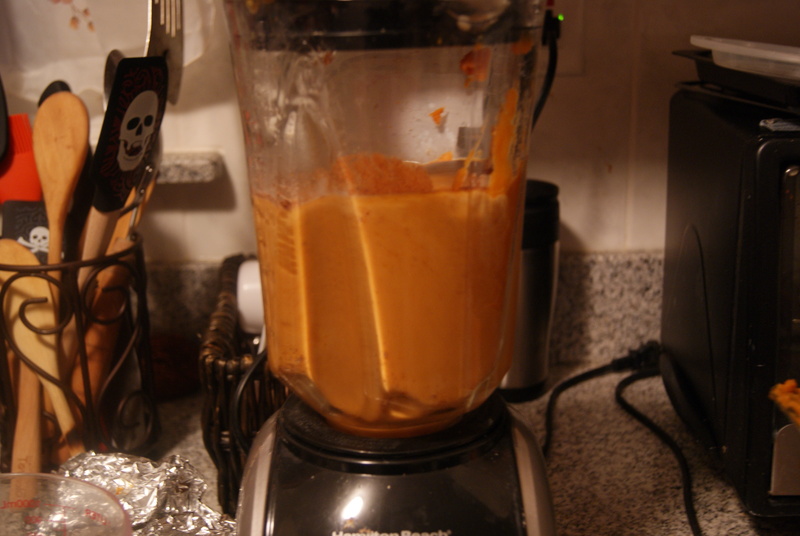 In a blender, puree coconut milk, pumpkin, sugar or syrup and spices until completely smooth. Toss your bread cubes with this mixture, then stir in chocolate chips until completely covered. Super easy, right? Even better: this can be a make-ahead dessert, in that you can stir everything together and toss this into the refrigerator, covered, up to three days before you plan to bake it. Um, in that case though, don’t preheat the oven until you’re really ready to bake. I guess that should go without saying, but I’d rather be safe, especially since ya’ll know where I live now. Sprinkle on brown sugar evenly over the mixture, then bake for 25 to 30 minutes until the top is lightly browned. Cool for about ten minutes, then dust with confectioners’ sugar if you please, and enjoy. I don’t think this picture does the pudding justice. I really love this dessert. I love it so much that I kept a good chunk of it back in my refrigerator. Sharing, schmaring, am I right? If you ever want to reheat the leftovers, I recommend throwing it back into the oven at 200ºF for ten minutes. Or, if you live in the woods, heat a skillet over a small bonfire. If you’re lacking wood, set out a couple of PB&J sammies for the neighborhood Bigfoot and you’ll be set in no time. God, that movie really ruined me. I had this at Thanksgiving, courtesy of this baker, and it was awesome! Thanks, Shibow. This sasquach says, Stay in the city and make this again! Thanks, cuz! 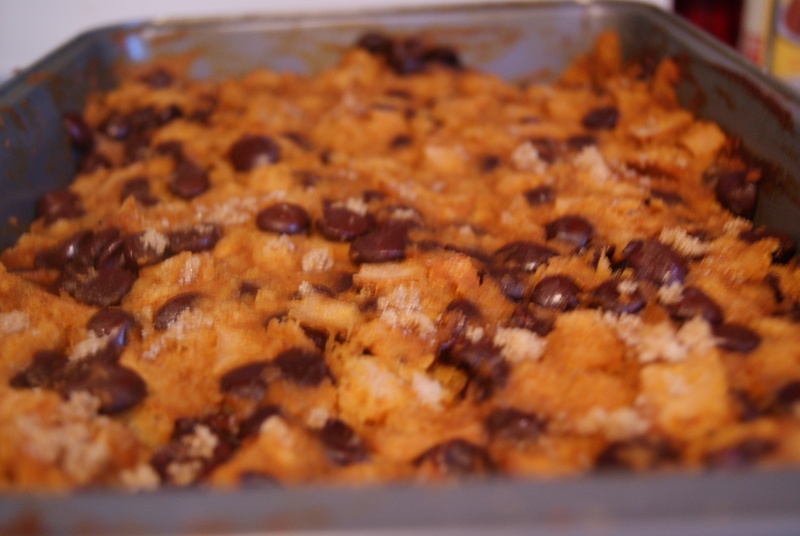 I’ll leave a trail of bread pudding to my new house in the forest just for you.